There are times when you really, really don’t want to write any kind of response to a contentious issue, no matter how burning it may be, not least because by doing so you will only compound the contention and exacerbate the division or hurt already being felt by the parties involved. But something just gnaws away, and the urge to say something simply won’t go away, so you either lie in bed every night churning the niggles or you plod wearily to your keyboard and hit the first key. And that first letter may lead to a completely superfluous paragraph which says nothing at all about the contentious matter at hand: it simply becomes a device for stalling; for avoiding the inevitable antagonism which will only elicit further testy Twitter blasts or belligerent counter-blogs full of bile disguised as fraternal enlightenment. 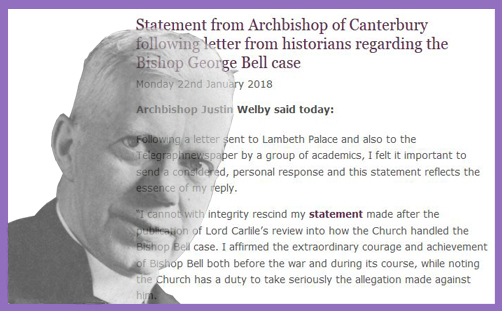 The Archbishop of Canterbury Justin Welby has responded to the eminent historians who criticised his response to the Carlile Report into the Church of England’s handling of the allegation against the late, great Bishop George Bell. The historians considered Archbishop Justin’s claims against George Bell to be “irresponsible and dangerous“, and called on him to retract the ‘cloud’ under which he has placed Bell in order to restore the reputation of the eminent deceased Bishop. The Archbishop of Canterbury has refused to do so. And with that sentence he has pinned his entire reputation and staked his whole legacy. He cannot now back down, for to do so would evidence a manifest self-misjudgment of character; a certain blindness, if not a total lack of the very integrity which others are already calling into question. “I cannot with integrity rescind my statement” is an expression of the very stuff which sent some of his episcopal forebears to the stake. Justin Welby isn’t going to resile, rescind or retreat on this: he will not recant; there is no surrender. Bishop George Bell was a man of “extraordinary courage and achievement”, but “the Church has a duty to take seriously the allegation made against him”. There Justin Welby stands; he can do no other. Well, he could have done, but now he’s dug his heels in, the course is set; the trajectory is fixed, because the eminent historians, theologians and other vocal defenders of George Bell also have no intention of backing down, which is why Justin Welby’s statement is quite possibly the most bungling and inept piece of PR to have been issued by Lambeth Palace since he was installed as Archbishop in 2013. Honestly, where do they think this now goes? How does Lambeth Palace think this will end? The issue isn’t just going to hang around like a bad smell: it’s going to hinder and detract from Archbishop Justin’s entire episcopal ministry; it’s going to bind and frustrate every utterance he makes on the themes of integrity, truth and justice. On the one hand is an Archbishop who cannot with integrity rescind his statement, and on the other is a growing army of very eminent lawyers, historians, theologians and crusaders for truth who cannot with integrity cease their campaign for Justice for George Bell. And this is a battle which the Archbishop will certainly lose – perhaps not while in office (so over the next three years), but either five or 15 years from now, or even 20 years after his death – because that army of eminent lawyers, historians, theologians and crusaders for truth will enlist another battalion, and if necessary another battalion after that, because people care more about the late, great George Bell than they probably ever will about Justin Welby. That’s harsh, but it’s true. It’s true because the man who perpetuates an injustice is never going to be judged favourably by historians, lawyers, theologians or crusaders for truth (especially those who despise the Church of England), so you can be sure – absolutely sure – that some time in the future one of Justin Welby’s successors to the See of Canterbury will find it expedient to sacrifice Archbishop Justin’s reputation as swiftly as the Church of England trashed that of Bishop George Bell. That is, if he isn’t unjustly accused of child abuse himself. You simply cannot rely on a disorganised and unfair process to sustain a premise that abuse happened when nothing in the evidence supports the single uncorroborated allegation. There is perhaps one very easy test we can make of Justin Welby’s integrity on this matter. He says: “the complaint about Bishop Bell does not diminish the importance of his great achievements and he is one of the great Anglican heroes of the 20th Century.” It does, of course (how can it not?). But if Archbishop Justin truly believes this to be the case, could he please issue a direction to revive the plans to install a statue of Bishop George Bell in Canterbury Cathedral, and also call on all those who have expunged the name of George Bell from their buildings to restore their original brands in honour of “one of the great Anglican heroes of the 20th Century”? And please do it soon. We really don’t need to start a petition, do we?